This picture aptly captures a man’s back breaking. One more time, for good luck. Italian health insurance has gotta be better than America’s, at least. And the sporting continues! 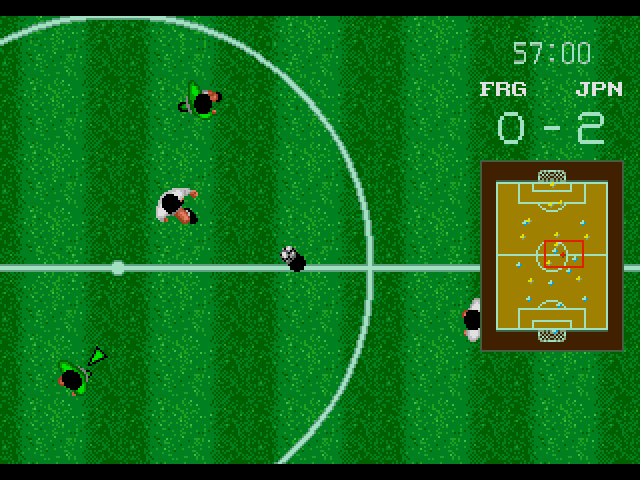 World Cup Soccer (renamed World Championship Soccer for the U.S. and World Cup Italia ’90 for Europe) is the Mega Drive’s first football game, an energetic top-down soccer sim that accurately represents the sport in 16-bit form. Whether you’re playing a test match to get a feel for the mechanics or a couple dozen matches for World Cup glory, World Cup Soccer has what it takes. There are 24 national teams to choose from, including crowd favorites West Germany, Yugoslavia, and the USSR. Teams are rated from 1-5 (1 the lowest, 5 the highest) in the areas of Speed, Skill, Defense, and Keeper before an overall score is determined. Once you choose your nation, you select 11 players from a group of 16. Goalkeepers, Defenders, Midfielders, and Forwards are all rated 1-5 on their Speed, Kicking Strength, Tackling Strength and Accuracy. Pick accordingly and let the games begin. Out of the teams I picked (West Germany and Scotland, for the curious), I only noticed some slight speed and kicking strength differences. Those more versed in soccer than I will probably notice additional subtleties. Well, you heard the map. Select your team. The player movements are sublime and mesh well with the game’s overall speed. Even I, a soccer ignoramus, was able to dribble, kick, shoot and tackle with ease, and more importantly, without reading the instruction manual. 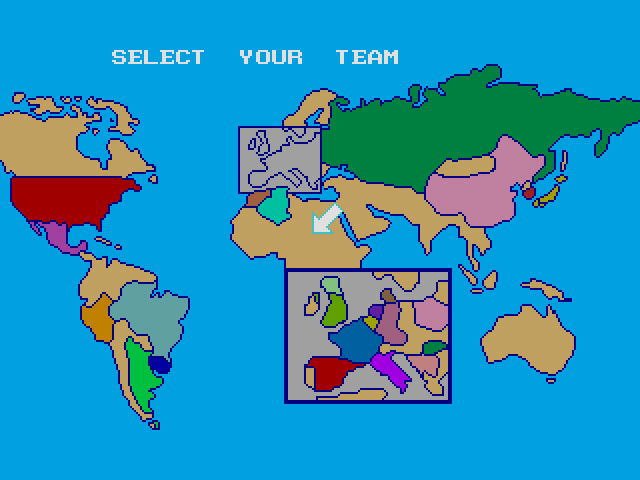 Sure, it helps that World Cup Soccer only has three buttons, but if Sega really wanted to jumble the controls, they could have (see: so many NES sports games). And while I’ve always thought of soccer as something of a slow sport compared to basketball or football, World Cup Soccer‘s fast pace challenged my beliefs. The speed kept me engaged, but wasn’t so quick that I felt overwhelmed. Me, after I finish writing a review. The top-down viewpoint might be a point of contention for some, but I never had trouble keeping track of the action. You’ll rarely lose sight of the player you’re controlling, thanks to a cursor that automatically bounces to whichever player is closest to the ball. The transitions are seamless and keep you focused on the game at hand. Orange sherbet, they’re gonna take it all this year. 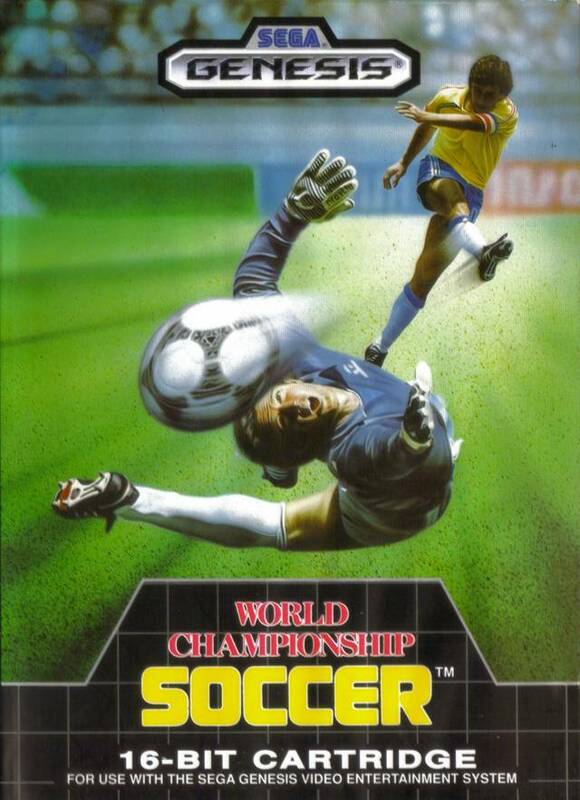 For the European release, a joint venture between Sega, Spanish firm Olivetti, and Virgin Mastertronic allowed them to secure the FIFA license for the 1990 World Cup. 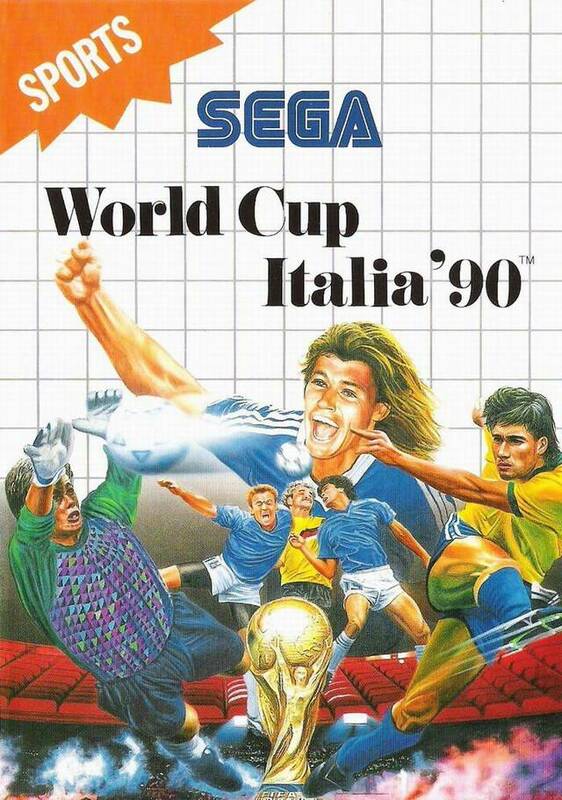 World Cup Soccer was renamed World Cup Italia ’90, but outside of the name and a spunkier title screen, the game looks and plays the same. Like the best sports games, World Cup Soccer is perfect for both football junkies and those who don’t care about goooooals. If you want to get lost in elimination matches and tournaments, you have the power (though the inability to save your progress in the World Cup is disheartening). If all you know about soccer is that you kick a ball, you don’t need to know what a midfielder does or whether Scotland’s McManus is better than Seamus at tackling to enjoy the rich ball-kicking within. World Cup Soccer plays to both sides and scores. I don’t think I’ve ever been as happy as this guy in my life. 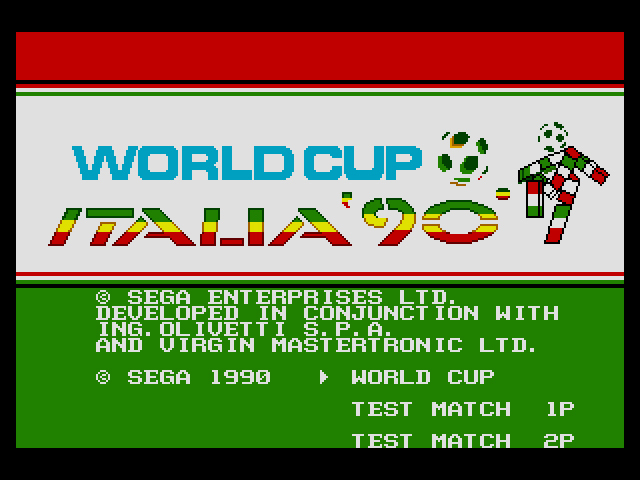 World Cup Italia ’90 for the Master System is not a lesser port, despite being on an older system. In addition to the Test Match and World Cup Options, a Penalty Kick mode has been added for some reason. The number of players has been reduced from 11 to 8 per team on the field (due to technical limitations, no doubt), but you can choose from seven additional teams (go Czechoslovakia!) and the soccer is, surprisingly, just as fast as the Mega Drive version. Passing, kicking, and shooting are just as intuitive, despite the Master System controller’s two buttons compared to the Mega Drive’s three. The top-down viewpoint is intact, but it’s been graciously scaled back to give you a wider view of the field. Also, the adorable 8-bit sprites and whimsical music add some lighthearted flavor to the otherwise serious soccer matches. Dare I write it? The Master System port is the better of the two. The Mega Drive version’s selling point – better graphics, chunkier music – doesn’t compare to the Master System version’s winning personality. 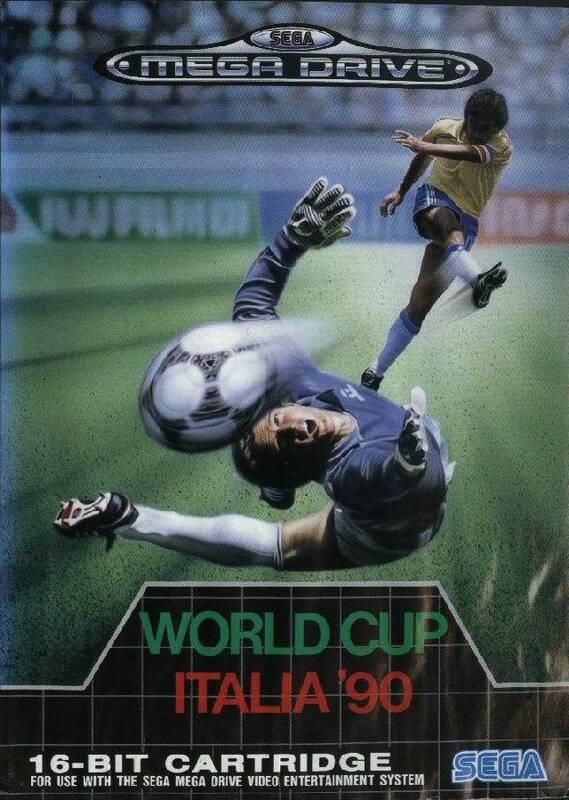 Shame that World Cup Italia ’90 only released in Europe. 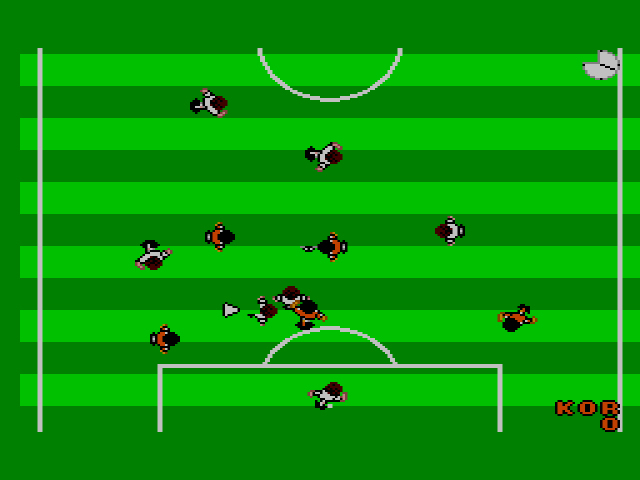 The U.S. could have used a better soccer game – or a better game, period – for the Master System during that time. I can remember playing this at my cousins back in the day. To be honest I find it a little pedestrian and the main problem was there were better football games around for the older home computers of the day like Microprose Soccer. For someone who has little experience with soccer/football outside of the NES and Master System, it’s pretty darn good, but I hear ya. It’s still an early Mega Drive title, after all. PS: congratulations on the retronauts gig! I love it when great minds come together! D’oh! You’re right. I will fix that post-haste. The name World Cup Italia ’90 was just to sell cartridges. 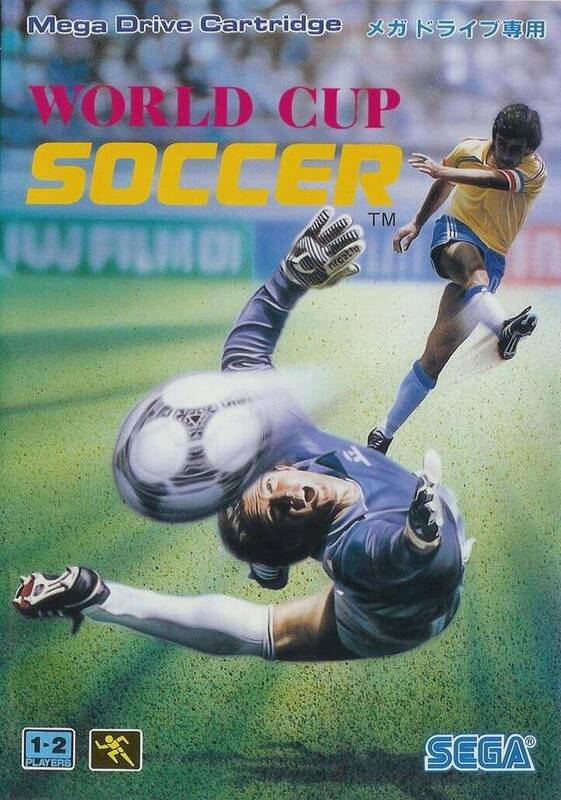 Sega didn’t adjust the game to make it more representative of the World Cup, at least for the Genesis version. And yes, the Master System version is the superior version in this case. Thanks for the Retronauts love! I’m looking forward to it! Well both games share at least one great feature … they both have tiny Belgium as a playable option 😉 !!! I adore this game. As I told you and Sam before I love 8/16 bit footy games but while most of them tend to fade in to obscurity this one has that certain something that just makes it memorable. If you look at it from a technical POV then it is abysmal but in terms of sheer enjoyment its right up there especially with a second player. I got this on the Mega Games I cartridge boxed with my Mega Drive back in the day. These days I have it on the Mega Games 6 cartridge under the title Sega Soccer since by the time that cartridge came out it was World Cup ’94 USA and the license had been lost. It is identical in every conceivable way except that it is now the Sega Cup rather than the World Cup. When discussing the worst games I’ve ever played with friends, I always pick World Cup Italia 90 as part of my list of shame. However, you make a fair point above – it was an early Mega Drive release and it’s first football game, so maybe I’m being unfair. I’d give it a D+ through gritted teeth…before reading your review, it would have been a F+. Playing games in order provides some perspective, I guess. I’m sure if I had played the games you listed prior to this, I wouldn’t care about it either. I had this game. Personally I’m not a huge fan of the sport. But this game was fun. The 2 player was good. And it had just enough graphical flair to say this is next gen, what with the goal digital stills and the out of bounds plays. At the same time it wasn’t really a meaty game. I played enough to beat it. And played two players with my friends a bit. But other than that it wasn’t super exciting. I can’t find a lot to say negative about this game. But I’m at a lack of words to really remember much positive eighter. I guess if your a big fan of the sport, this would be a fun game. To me it was something I played a bit, before never really playing again. True. Then again, maybe the games I listed weren’t all that good either. One of the good things about you reviewing all these games again is to see how well they have aged….I doubt European Club Soccer has aged too well! This was one of the first Megadrive games I played at my friends house back in 1991 on his exotically imported Japanese Megadrive. I completely agree with your grade, Dylan. Back in the day this was brilliant fun to play, especially as a two-player game, and tied in perfectly with World Cup fever that gripped the nation when England reached the semi-finals of the 1990 World Cup. 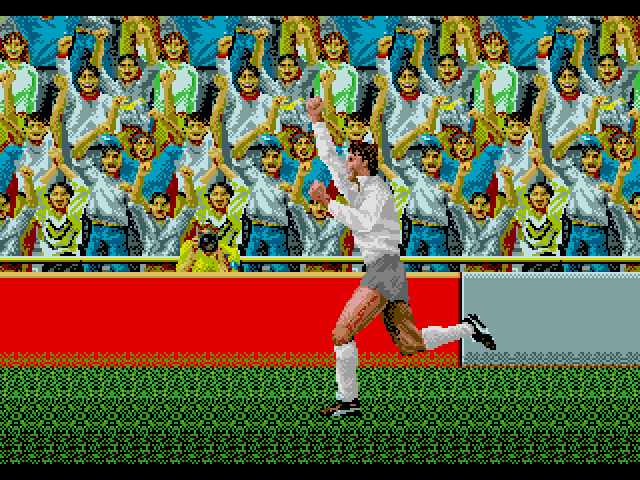 As a kid, I remember being impressed by the quality of the graphics, particularly the vibrant colours, and the great music and sound effects (the thwacking tackles and South American gentleman shouting GOOAAALLL!). Compared to what I had experienced up until then on the Master system, NES and, dare i say it, the BBC Micro – this was an enormous step up. Bliss was it in that dawn to be alive! One of the big limitations of the game for me, however, was the pointlessness of the passing button, as most goals were scored by lobbing the ball diagonally towards a striker near the penalty area, who would then head the ball diagonally into the net. Passing the ball around is favoured by football purists, and WCI90 doesn’t really let you play that type of game. Funnily enough, the English are known for their primitive, long ball ‘route one’ football, which is what this game encourages. But I guess it’s a game (a fun one at that) and not meant to be a simulation. One easy to miss aspect of WCI90 is the penalty shoot-out sub-game that appears if the match is tied after 90 minutes. At this point, the graphics switch from a top down view to a pitch side angle where you can take penalties facing the goal. I always remembering losing to my friends in this section of the game, which is incidentally what happened to England in the 1990 world cup! Never caught that one, Johnny. Thank God I never had a game that went beyond 90 minutes. 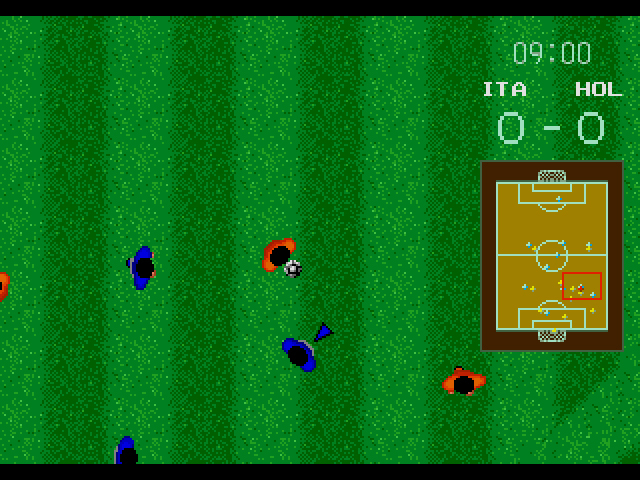 Sega did eventually include the penalty shoot-out as an option on the main menu in the Master System version. Thanks for sharing your memories of the game! They are always welcome. I have the instruction manual!! It’s awesome memorabilia! But it was released in Canada and could have found its way into the States that way. Does that count?